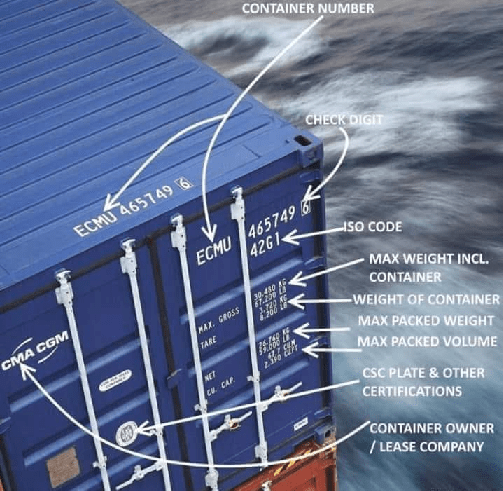 Personnel working in the Logistics sector or even layman looking at Trailers carrying containers would be intrigued with the series of numbers, alpha numeric numbers and markings on containers. It is however important for people in the Logistics and supply chain network to get a hang of these markings and what they denote. It is pertinent that all stakeholders handling containers like consignors, consignee, CHAs, warehouse personnel, packagers, EXIM personnel understand these markings for smooth and seamless day to day operations. Container Number – It is an alpha numeric sequence made up of 4 Alphabets and 7 Numbers. This number is unique to a container and is never duplicated. The container number identification system has been created by the International Standards Organisation under their code IS06346:1995(E). The owner code is unique to the owner of the container and the registration of this code rests with Bureau International des Containers et du Transport Intermodal (BIC). 4th letter : category – 1 letter (in our example, U denoting a freight container. Other categories being J for detachable container related equipment (such as Genset) and Z for trailers and chassis). This owner code is registered with the Bureau International des Containers et du Transport Intermodal (BIC). Check Digit — It’s the last digit of the container number listed above. This number is used to identify if the container number sequence is valid or not. ISO Code – International Standards Organisation under their code IS06346 gives each container type a unique ISO Code in order to avoid any ambiguity in identifying the size and type of container. MAX. GW – Max Gross Weight indicates the maximum weight that the container can carry. Gross weight includes the tare weight of the container. TARE – This is the tare weight which is the weight of an empty container. This is an important weight to be considered by all ship operators and planners as this weight needs to be included when container stowage planning is done. MAX. CW or Max. Payload – The maximum weight of the cargo that can be packed in the container. This is the weight that is shown on the bill of lading and it DOES NOT INCLUDE THE TARE WEIGHT OF THE CONTAINER. Shippers must pay special attention to ensure this weight is not exceeded when calculating the weight of the cargo. CU.CAP. or Cube – The maximum volume in the cubic capacity of the container. CSC, ACEP & Other Certifications – Every legal and in-service container will have a valid safety approval plate called CSC (Container Safety Convention) plate in accordance with the International Convention on Safe Containers of 1972. Classification society label for type testing – This label shows the classification society that has tested and certified this container for strength, cargo worthiness, and seaworthiness.